I've been dying to post this entry for MONTHS, but at long last the ‘embargo’ on it can be lifted as I finally have them in hand - or at least on foot. These are a pair of genuine series six Matt Smith Doctor Who boots. I was put onto them by one of my readers and clients, who searched high and low for the bootmakers – and his work was truly rewarded. 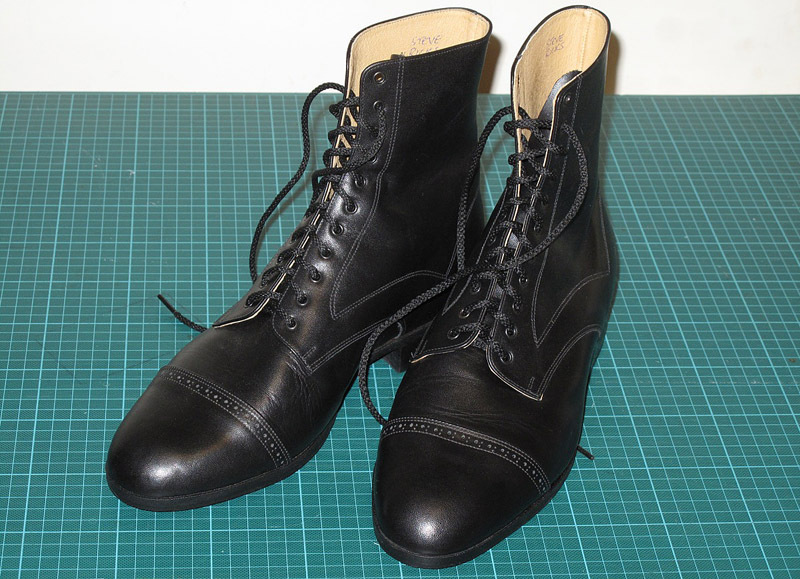 For ages now, people have been searching in vein to find the right boots, and although they have found pairs that are similar, or have details that are partly or mostly right, no-one has actually definitively found them. And there is a very good reason. 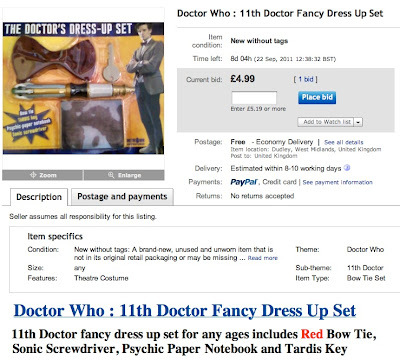 I can 100% confirm they were custom made specially for the series to a design of the BBC costume department’s choosing. One of my readers who often comments in my blogs recently raised an interesting question, and one which got my thinking. 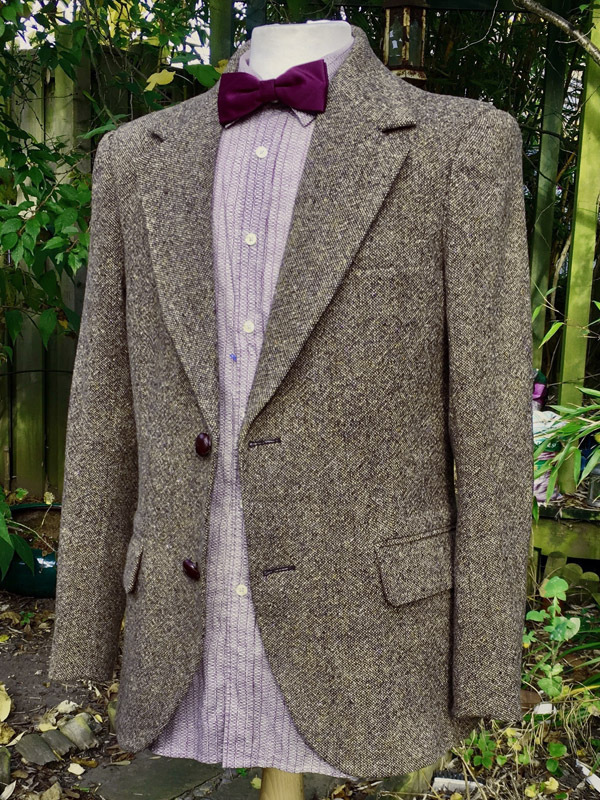 Curious question Mr Steve; Are you finding the 11th Doctor’s clothing easier to replicate, in say, comparison to something such as the 10th Doctor’s coat? 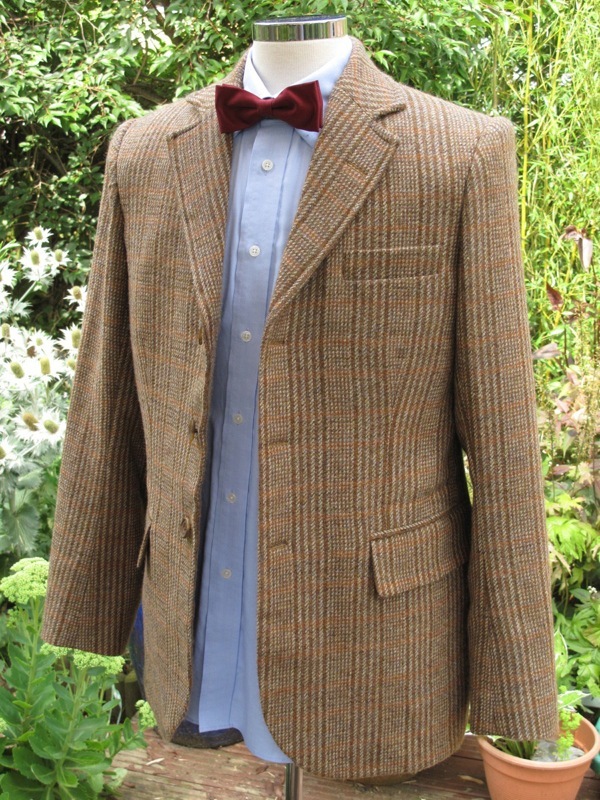 I’ve noticed he has a lot of things that you’re able to jump right on, whereas Tennant’s coat was evil in the details. The simple answer to this is a resounding yes, and for a multitude of reasons, sone of which I don’t think are immediately apparent. The advent of a new season of Doctor Who inevitably sparks a flurry of activity in the cosplay community. 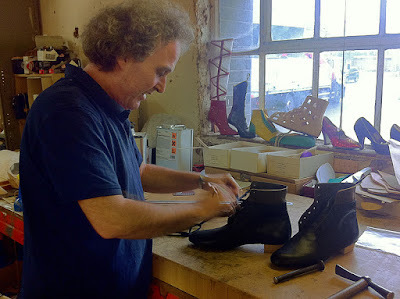 If there is a new look - how to achieve it; if there is a new garment - where did it come from. 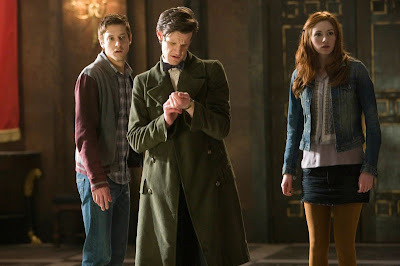 The advent of a new Doctor though - well that’s something else. But that wasn’t always the case. The best way to get my thoughts across is to work backwards. 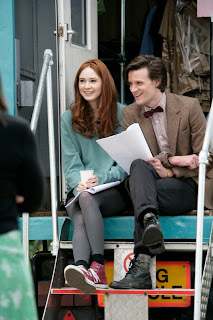 We first got a glimpse of Matt Smith in costume in July 2009, when an official publicity still was released just prior to the first location filming for series five (see right). With shooting due to start in such a public place, I guess the BBC thought the fans and press would inevitably get photos. 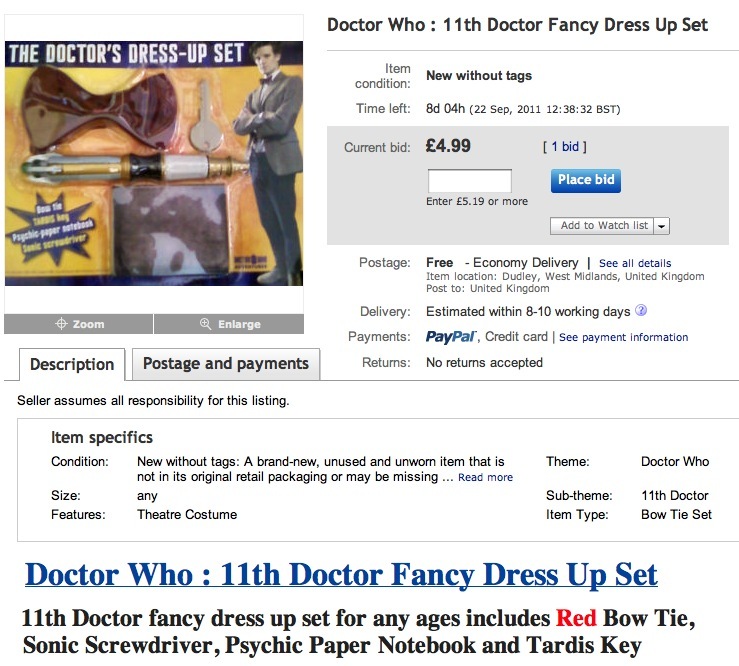 These would be around the net like wildfire, so it would be better to manage the release of The Doctor’s new look in their own, controlled way. 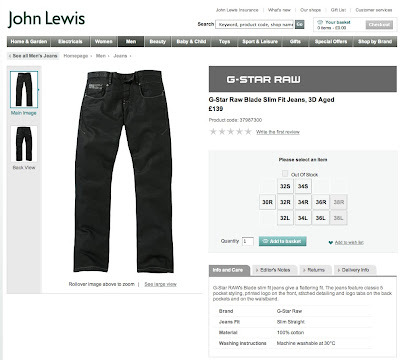 What they did give us though was a high res ‘pack shot’ containing the best reference to the fabrics of his costume and it wasn’t long before the Paul Smith shirt was spotted; the TopMan jeans were identified; and those All Saints boots was snapped up. All of these were in the twilight of their life on the high street, so time was of the essence. Within weeks stocks were pretty much gone. The UK’s magazine for younger Doctor Who fans, Doctor Who Adventures, gives away some form of free gift on its cover each and every week. This will vary from a Slitheen whoopie cushion; to a cyberman face mask; or just a note pad and pencil. All for the princely sum of £2.75. You can’t go wrong! One unscrupulous seller on eBay has listed theirs for sale - with a starting price of £4.99, and you don’t even get a free magazine with it. The thing that amazes me is that there’s even a bid! 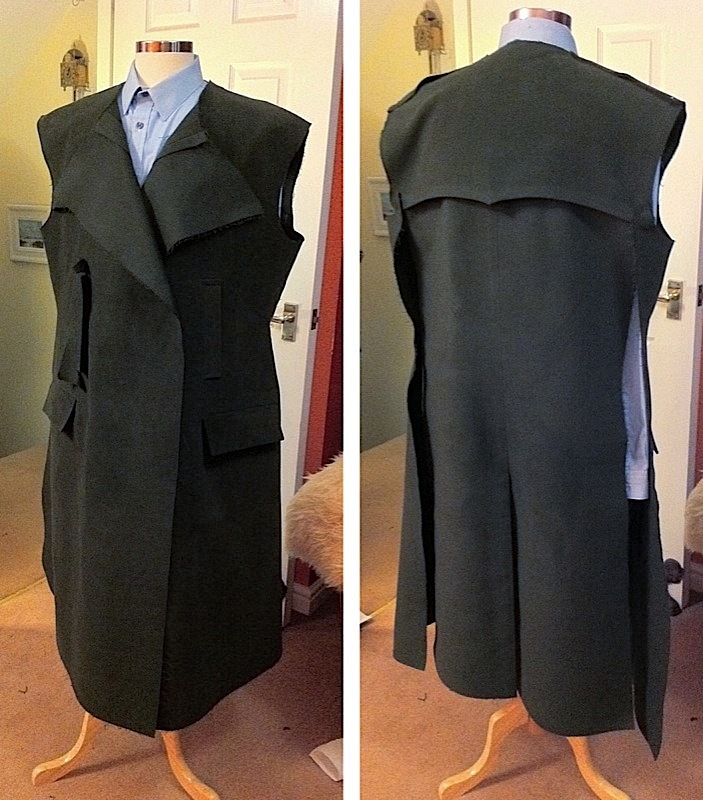 I had to skim through the making of my Greatcoat, but at last it is now finished and ready to wear! I previously posted a quick iPhone photo, and I did promise some better images, so here goes. I’m very pleased with the result, and I can report it is the most comfortable coat to wear. I have given it very generous pocket depths, and it’s really nice and snug to put your hands in the vertical pockets. I decided to keep some of the tailoring on the collar down to a minimum so it can be worn as a reversible collar – ie it can be flipped up at the back. As you may have been reading, I’ve been having a bit of a roller-coaster couple of weeks since just after Let’s Kill Hitler was shown. Doing my best to keep my mind off things, I have immersed myself in finishing off my Greatcoat. 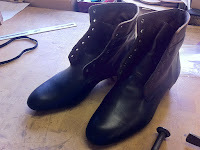 As I mentioned before, I haven’t documented its full creation, but here are a number of photos of it at various stages. First I made the panels for the fronts and the back. 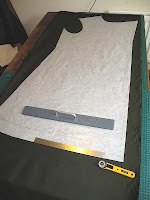 The pocket were made and set, and the storm vents on the front and back were sewn in place. 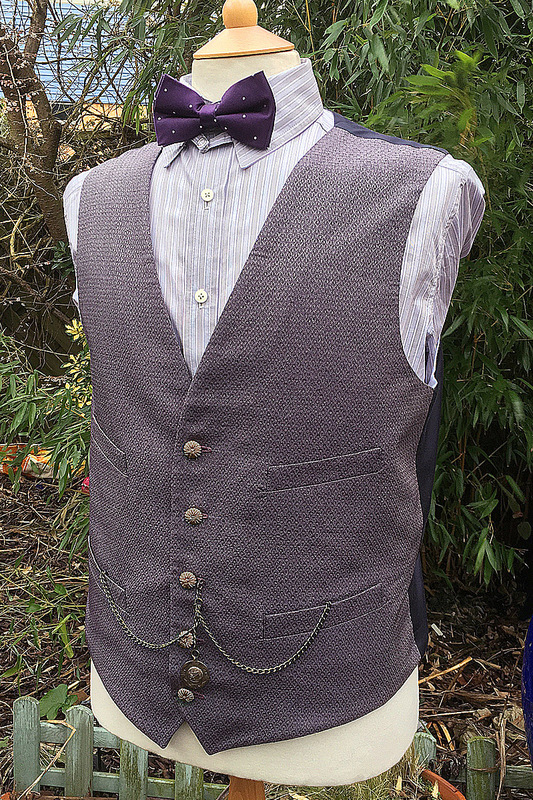 As a quick check I pinned the shoulders together and put it on my mannequin (see left). So I have found myself an ideal pattern on which I can base my Greatcoat, but you might be interested to read how I got to that point. College finished for the summer term back in July and because I am on an adult learning class we don’t start back until after the main juvinial students have settled in. This was going to leave me around 12 weeks without college support! Something I greatly value. It kick starts projects; gives me incentives to maintain them; sets short-term deadlines to meet; as well as the help and advise from a knowledgeable tutor. Before college broke up, she was encouraging us to join some one day classes running during the summer break, mainly about patchwork and machine embroidery, so not really any direct help to me. I suggested holding a one-day sewing workshop with no specific agenda, so we can catch up and maintain continuity with our ongoing projects. A lot of my classmates agreed this was a good idea, and our tutor said as long as eight of us signed up it would run. Well, enough did and on 23rd August we had the class – perfectly timed as it was only a few days before the return of Doctor Who. 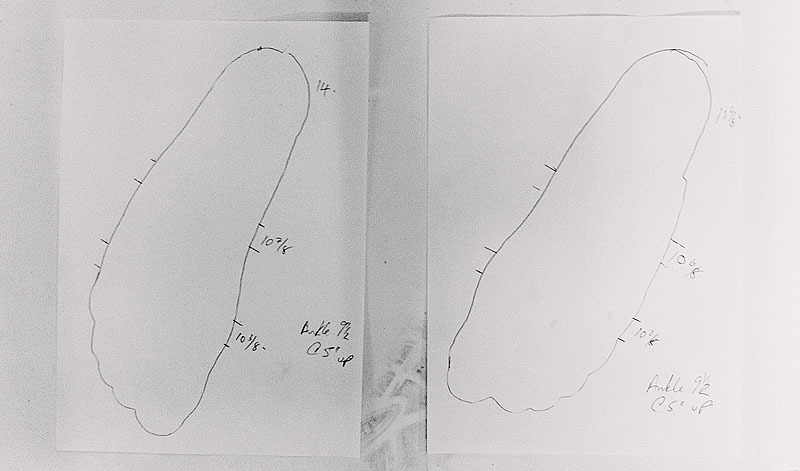 My plan was to use the five hours of it to nail this pattern ready for cutting. 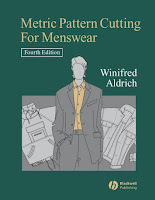 My tutor recommended referring to my copy of Metric Pattern Cutting For Men, which has proved to be a reliable source of pattern essentials. 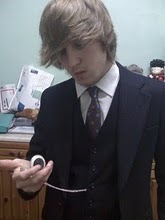 I have used it before when I was designing the collar to the Ultimate Tennant Suit with good results. I do prefer to use my period cutting guides, but this would still be a good place to start. 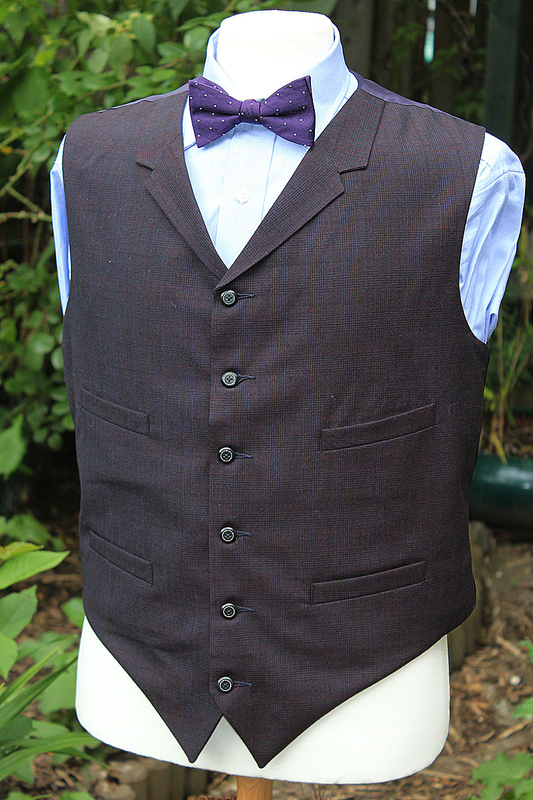 An outer garment needs to be that bit larger around the middle, to allow for a jacket or suit to be worn underneath. So it’s worth following this block rather than enlarging a jacket. Someone recently sent me a link to the John Lewis website, where they are currently selling the correct, slim fitting G-Star RAW Blade jeans in the 3D aged fabric. If you wanna grab a pair, be quick – they are listing low stocks on all the remaining sizes. 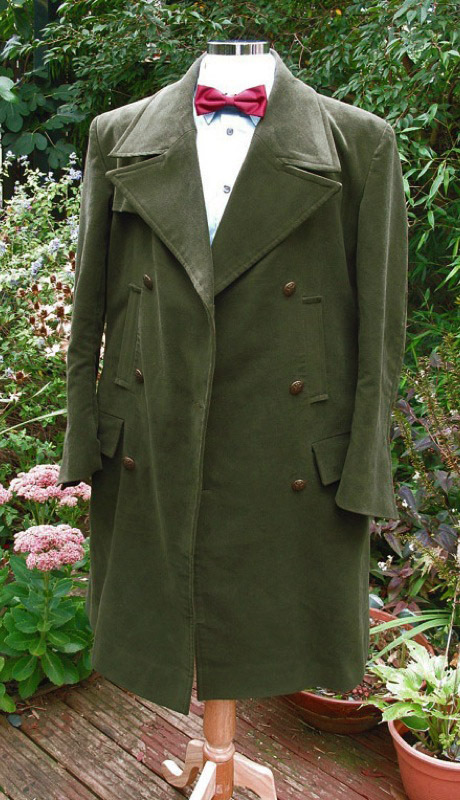 I am now well into researching a pattern for my Green Greatcoat. 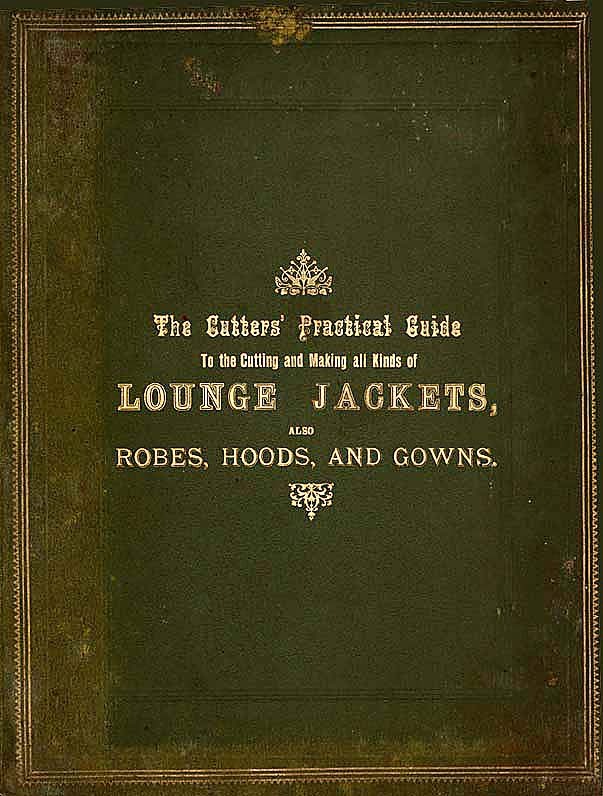 Some of you may recall that I found a Cutters Guide from the 1890s (see right), which contained instructions on the construction of a basic lounge jacket block. 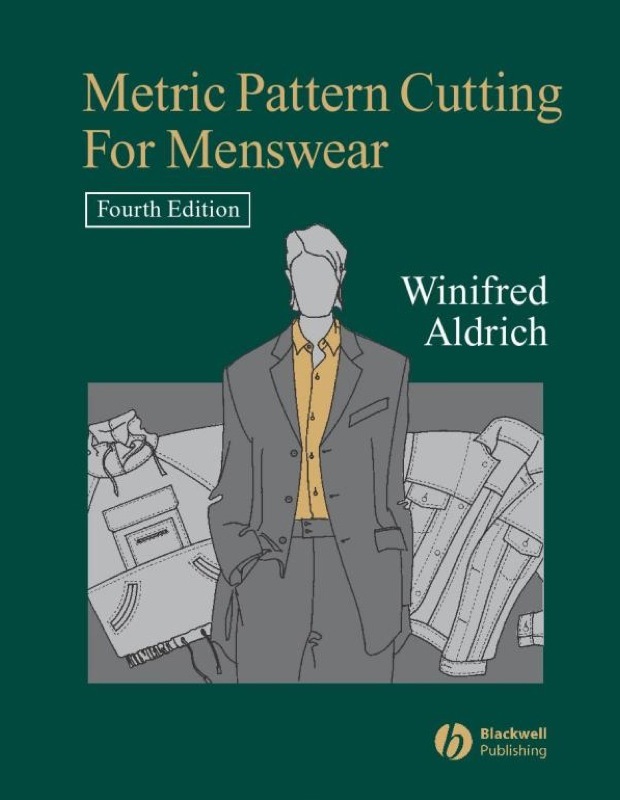 This has severed me very well, and was the basis for both the Ultimate Tennant Suit AND the recent Shetland and Donegal Tweed jackets I have made. 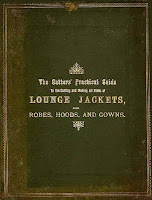 But of particular interest is a section regarding British Navy, Army and Air Force uniforms and greatcoats, including the instructions for how to cut them! THIS is what I will use to create a basic pattern from which I can extract what I need and adapt to create the Green Greatcoat design. Below is a list of the patterns in the book which are of interest to me, some more than others, but here they all are. 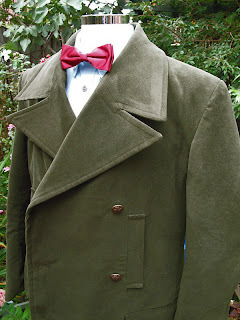 So, you’ve guessed it, I’m gonna have to make myself one of these green overcoats! How can I resist? Well I’m already a couple of steps ahead – when I first saw the coat I did recognise that it was a moleskin fabric. It just has that certain look that only moleskin has. I’ve done my research and sourced the perfect fabric to use. 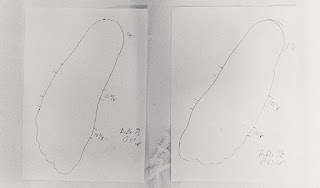 What I’ve got to do next is devise a suitable pattern. Now, I’m not expecting you to remember this (but bonus points if you did), but back in February last year I went to a surplus costume sale at Angels, the UK’s largest film & TV costume supplier. 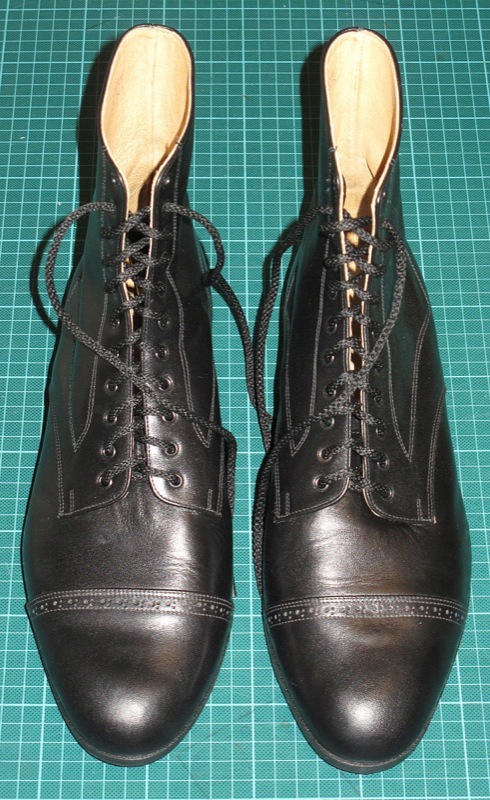 It was a total bun fight with rooms filled with shirts or hats or trousers or ties – all of which were not much above the quality of the lesser stock seen in a charity shop. Precious little had an Angels (or Berman’s) label in – and nothing was attributed to any actor or production. It really could have been anything. However, there was a room which did interest me, one which contained all manner of military uniforms and greatcoats. The only problem was finding stuff of a decent size (most seemed to be for a chest 36 or smaller) or that still retained its original buttons (most had been ripped off and were bare). Well here’s a funny thing. 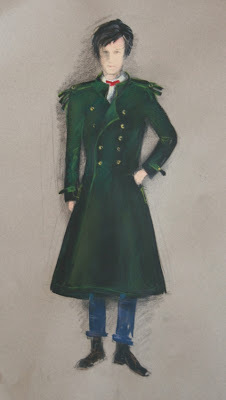 I’ve been looking at the possible inspirations behind the new Green Greatcoat, and I came across this little curiosity. I found it on the website for June Hudson. It’s a speculative design by the legendary costume designer – the goddess of Who clothing in the late 1970s and early 1980s. 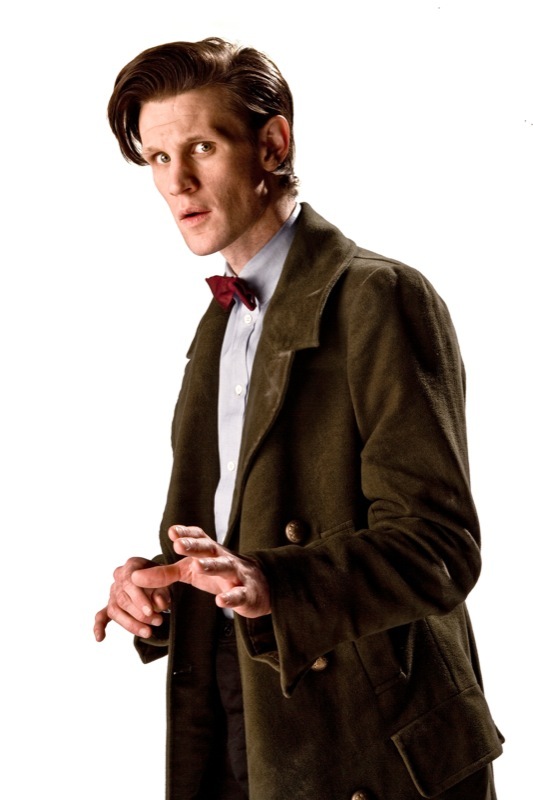 Speculative design: a green, military-influenced overcoat for Matt Smith as the Doctor. Produced in association with a class at the University of Redlands - Designing for TV Science Fiction. 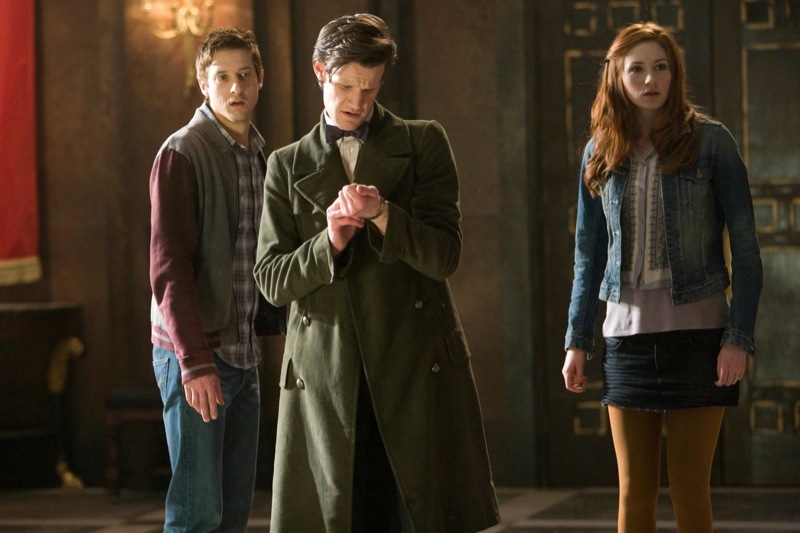 Now this pre-dates Matt’s season six costume fittings by about a month! 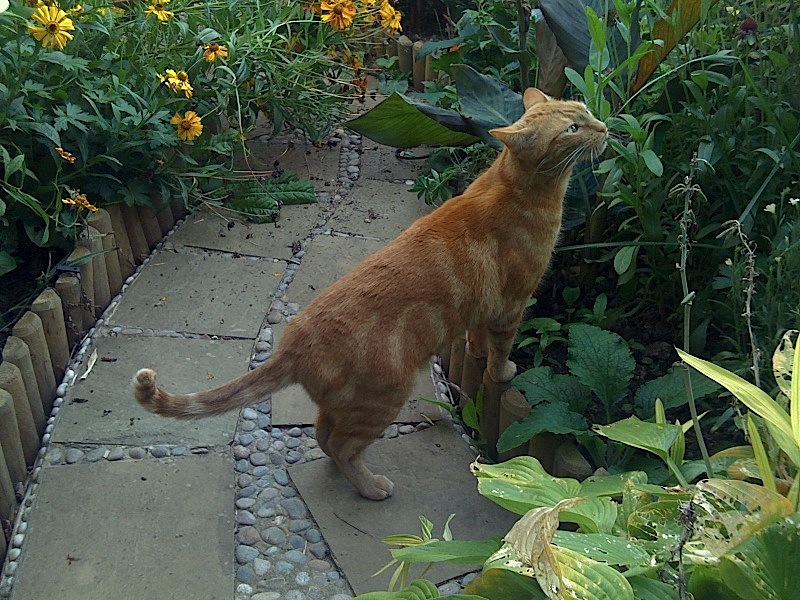 Could it be that June’s influence is still felt today – I very much hope so – or is it just an amazing coincidence? 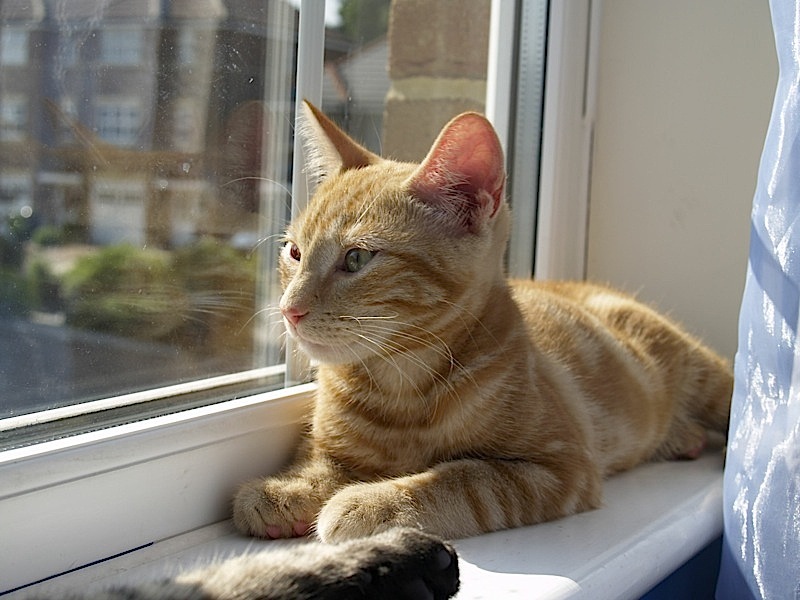 The past week has been understandably disrupted, but I’m starting to get myself back on track. I haven’t been as productive tailoring-wise – it’s been hard to settle into any level of normality – but I have spent some time researching and drafting some new entries, one of which is a real cracker and well worth a look! Check back over the weekend to start reading them. Finally, another thank you to the many people who posted comments in my blog following the new of Chester’s loss. Additional comments are always welcome.